Perform inspection after removal, installation or replacement of camshaft or valve-related parts, or if there are unusual engine conditions regarding valve clearance. 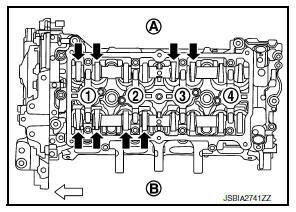 Remove rocker cover. Refer to EM-46, "Exploded View". Set No. 1 cylinder at TDC of its compression stroke. 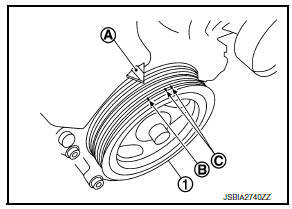 If they do not face inside, rotate crankshaft pulley once more (360 degrees) and align as shown. Measure the clearance between valve lifter and camshaft using suitable tool as shown. 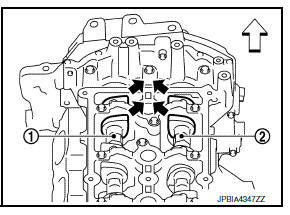 Valve clearance : Refer to EM-119, "Camshaft".
)] as shown using suitable tool. Set No. 4 cylinder at TDC of its compression stroke. 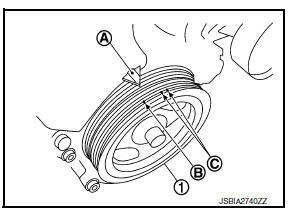 Rotate crankshaft pulley (1) one revolution (360 degrees) and align TDC mark (no paint) (B) to timing indicator (A) on front cover. as shown using suitable tool. If out of standard, perform adjustment. Refer to вЂњADJUSTMENTвЂќ. Perform adjustment depending on selected head thickness of valve lifter. Remove camshaft. Refer to EM-60, "Exploded View". Remove valve lifters at the locations that are out of the standard. Measure the center thickness of the removed valve lifters using suitable tool (A). Thickness of new valve lifter (B) can be identified by stamp mark (A) on the reverse side (inside the cylinder). Stamp mark вЂњ302вЂќ indicates 3.02 mm (0.1189 in) in thickness. Available thickness of valve lifter: 26 sizes range 3.00-3.50 mm (0.1181-0.1378 in) in steps of 0.02 mm (0.0008 in) (when manufactured at factory). 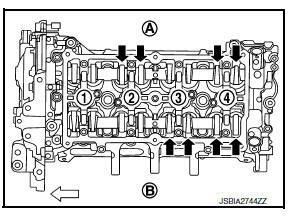 Refer to EM-119, "Camshaft". Install camshaft. Refer to EM-60, "Exploded View". Install timing chain and related parts. Refer to EM-48, "Exploded View". Check that the valve clearances are within the standard. Refer to вЂњINSPECTIONвЂќ.